Flagstone Sealer Wet Look is a color enhancing, wet look, silicone, and acrylic combination sealant. It protects surfaces from salt water, pool chemicals, oils and vehicle fluids. It infiltrates deep into the surface. Forming a barrier that will protect stone for years. While maintaining a wet-looking sheen that many people enjoy having outside. At TSS Pro Sealants, we can meet all your Flagstone Sealer Wet Look needs. Because when you have beautiful flagstone outside. You want it to last and to make it last you need a sealant. With all the various types of sealing products, it can be overwhelming for a homeowner to know what to buy. And understand why they need a sealant on their flagstone flooring. But with TSS Pro Sealants, we will help you choose the sealer that is best for your home. In this article, we will highlight the benefits of having a Flagstone Sealer Wet Look. And why TSS Pro Sealants carries the best sealants on the market. As you can see, our sealer offers many benefits and features that will benefit your flagstone flooring. Our sealant is deep penetrating, solvent-based, breathable. And leaves the sealed stone with a rich, wet-look finish. The sealer is made from silicone and acrylic polymer, making it highly durable and long lasting. Below are the important advantages of Flagstone Sealer Wet Look that not many homeowners may realize. Our sealer is resistant to stains from spilled materials, oil, dirt, etc. Sealing your flagstone will also resist UV rays. Which may help your flagstone retain their natural color longer. And will also protect from water and snow seeping into the pores. Because if water constantly seeps into the pores of the flagstone. It will cause puddles underneath which will cause the flagstone to rise and disfigure over time. Weather resistant is one of the number one reasons why homeowners are choosing to seal their flagstone. Sealers also have the benefit of preventing weeds from growing between paver joints. Because it soaks into and hardens joint sand, it also causes the sand to resist displacement from rain, wind, and insects. When many homeowners choose to seal their flagstone flooring. They prefer glossy sealants which can give your flagstone a “wet look”. Causing the natural color of the stone to appear more vibrant. Which is why Flagstone Sealer Wet Look has become so popular with homeowners. Because when you spend an exuberant amount of money. To create the backyard of your dreams. You want to make sure that everything stays beautiful and vibrant outside. And typically, the darker the stone. The more pronounced the color will be after applying a Flagstone Sealer Wet Look. Often homeowners think that when they are sealing their flooring. It will take a long time to dry. And do not understand how flooring will be able to dry around a pool because it is always wet. But with our Flagstone Sealer Wet Loo,k there is virtually no drying time necessary. The sealant is put in place and you will be able to walk over it in less than 30 minutes. And you do not need to worry about anything be compromised during the process. Another advantage of sealing your flagstone is that is it resistant to pool chemicals. You do not need to worry about your pool chemicals harming your flagstone. 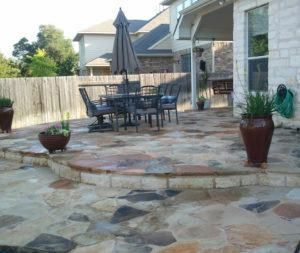 We design the sealant to protect your flagstone from the chemicals. And in the process of protecting your flagstone. It does not have harm to the sealant. It stays put defending against the outside elements. When you are looking for the best Flagstone Sealer Wet Look. Then you are needing to call TSS Pro Sealants. Because at TSS Pro Sealants we have developed our own flagstone sealant over 18 years. Using formulas that we know work, offering protection for years. In the pas,t we have scraped and chemically removed more poor quality acrylic sealants. Which is why we started making our own brand in the first place. It just made good business sense. Because we could not continue to sell sealants that we knew were not working. Our sealants are the best on the market to make sure that your flagstone flooring lasts for decades against the outside elements. Give is a call today at 888-958-0556. To speak to our friendly specialist and how we can help you with all your Flagstone Sealer Wet Look needs.